The Place For those who have memories of old Beach Road, The NCO Club used to be the building where non-commissioned officers gather to chill over drinks, which has been around since 1952 and is now a preserved building as part of the JW Marriott property. The building seems like a private clubhouse from the outside which houses a Chinese restaurant Madame Fan, along with three other drinks driven concepts – Fish Pool where you can get your champagne, caviar and oysters, along with Stags’ Room to lounge around with their vast wine list, and lastly Cool Cats which is where you can get your cocktails while enjoying Jazzy or Pop music. The highlight for me in NCO Club, as a foodies more than a drinker per se, is undoubtedly Madame Fan. The concept of Madame Fan is an etiquette-free lifestyle dining, defined by celebrated London-based restaurateur, Alan Yau who is also behind Michelin starred Chinese restaurants Hakkasan and Yauatcha in London. Madame Fan is also his first Southeast Asian venture. As a restaurant which spans across the entire level 2 of the building, the space at Madame Fan is gorgeous, to day the least. It is classy and sophisticated, and yet not the opulence I dislike, with nice pockets of space like the private dining rooms, the iconic Chairman room which can fit up to 20 persons on the round table, and even a mini bar area if you fancy some pre-dinner drinks. The main dining area of the restaurant is modern chic, where there is a DJ spinning different genres of music on different days. The Food At first glance, the menu is quite concise, split by courses and types of meats. The full range of dim sum is not available during dinner, and we managed to try all the four dim sum dishes available on the dinner menu. We started with an assortment of dim sum like the Scallop Shumai (S$18), Sri Lankan Mud Crab Wonton (S$18), Chinese Chive Dumpling (S$8) and Sichuan Vegetable Dumpling (S$6). My favourite of the lot is the Scallop Shumai, topped with generous filling of the scallop meat. The Sri Lankan Mud Crab Wanton is another convenient way to enjoy the crab meat without getting your hands dirty. This is one of my favourite dish, the nutritious sounding double boiled Four Treasure Soup (S$28) which consists of sea cucumber, fish maw, dried Hokkaido scallop and crab meat. Served in a young coconut, I get the sense of the aromatic coconut flavour along with the soup, which has a dense texture and it tastes like a collagen rich broth that I can’t help but finish till the last drop. My recommendation is to have as it is first, before adding some vinegar midway which changes the flavour profile of the soup completely, for the better in my opinion. One of the highlights at Madame Fan is the Crispy Aromatic Duck (S$38/half). 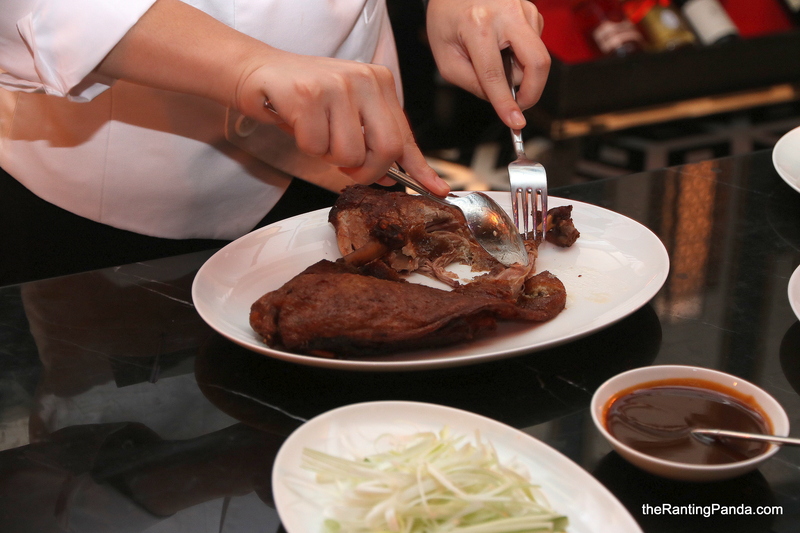 It is like the restaurant’s take on Peking Duck as the skin is sliced by the staff before being wrapped in the pancakes, along with baby cucumber, Thai spring onion and duck sauce. That said, it is not quite like the glistening skin of typical Peking ducks so do not expect it to be very crispy either. In fact, I enjoyed the duck meat more on its own after the remains of the meat was served to the table, which is quite flavourful. I also tried the Steamed Soon Hock (S$14/100g) with Ipoh Soy and Spring Onion, a delicious plate of fish meat which is ideal for sharing. The Ipoh soy sauce adds much flavouring to the fish meat, which makes it more enjoyable. My least favourite dish is the Home Style Crispy Pork Stir-Fry (S$16) with bitter melon, preserved cabbage, yu tofu and black bean. It pales in comparison to the other dishes and comes across as ordinary, and the other reason is also because I’m not a bitter melon lover. For a comforting carb dish, go for the Handcut Taiwan Noodle (S$16). Served with La La clams and wine dried pork, it is a hearty dish as the flavours are straightforward. The noodles are not too thick and I like the slightly moist texture from the broth. The clams are fresh and soaked up the flavours of the broth well. For desserts, it ended off with something which I enjoyed unexpectedly. The Mojito Lemon Tart with Mandarin Sorbet is a sweet yet refreshing combination, well-balanced and concludes the meal on a good note. Rants The main dining hall of the restaurant is relatively dim during dinner, which is not quite the typical Chinese restaurant setting. Will I Return Again? Madame Fan is a Chinese restaurant to impress your folks or partner, where the ambience is very different from the typical oriental vibes of most Chinese restaurants. While prices of the dishes are not cheap on average, I would say the overall experience is still worth that occasional splurge. Make your reservations instantly at Madame Fan here.